Cheridene Green | Clarksville Sports Network - Clarksville Tennessee's most trusted source for sports, including Austin Peay State University. 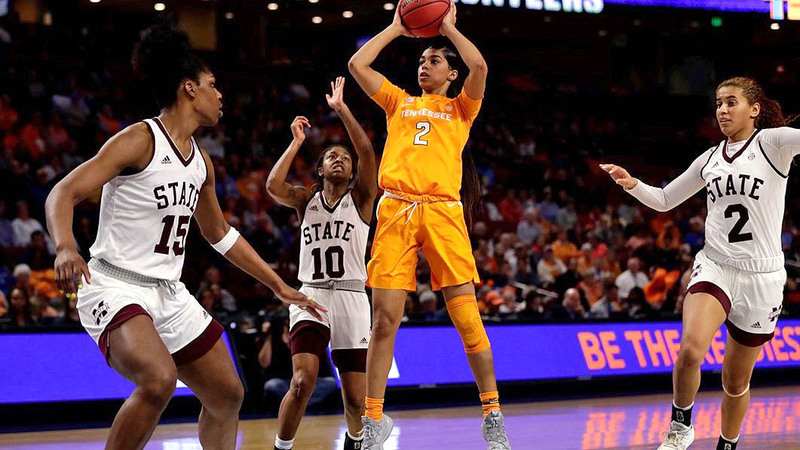 Greenville, SC – The Lady Vols led by six after the first quarter but couldn’t hold on against a top-seeded Mississippi State team that shot 61.5 percent in the second half, falling in the quarterfinals of the SEC Tournament, 83-68, on Friday. Knoxville, TN – No. 8 seed Tennessee Lady Vols (19-11, 7-9 SEC) will meet No. 1 seed Mississippi State (27-2, 15-1 SEC) at noon on Friday in the quarterfinal round of the SEC Tournament. 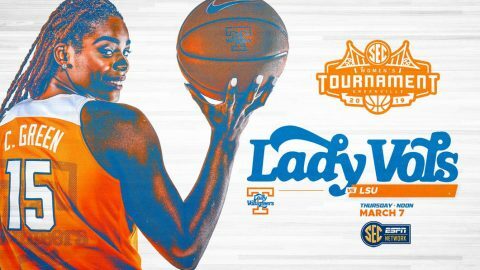 Tip-off is slated for 11:02am CT at Bon Secours Wellness Arena in Greenville, SC, for a contest that is being televised by the SEC Network and carried by the Lady Vol Radio Network and SiriusXM Radio. The winner of the UT-MSU game will advance to face the victor of Friday’s contest between No. 4 Kentucky and No. 5 Missouri at 4:00pm CT (ESPNU). 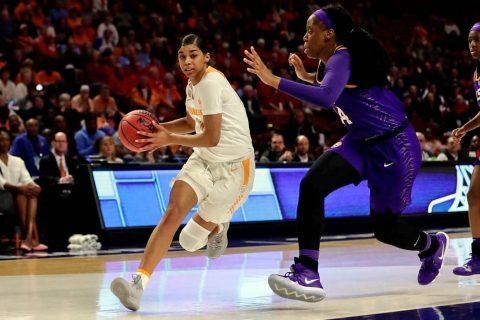 The Lady Vols survived and advanced by coming from seven down in the third quarter to defeat LSU, 69-66. Knoxville, TN – No. 8 seed Tennessee Lady Vols (18-11, 7-9 SEC) will meet No. 9 seed LSU (16-12, 7-9 SEC) at noon on Thursday in the second round of the SEC Tournament. 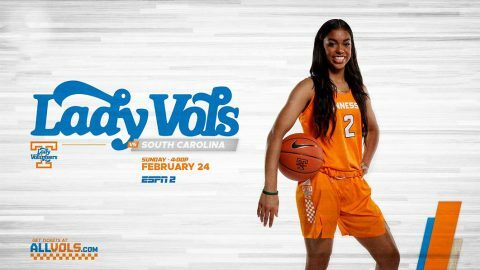 Tip-off is slated for 1:02pm CT at Bon Secours Wellness Arena in Greenville, SC, for a contest that is being televised by the SEC Network and carried by the Lady Vol Radio Network and SiriusXM Radio. The winner of Thursday’s game will advance to face No. 1 seed Mississippi State (27-2, 15-1 SEC) at noon on Friday. The Lady Vols closed out the regular season on Sunday with a dominant 81-56 victory at Ole Miss, moving from 10th to 8th in the SEC standings. Oxford, MS – The Tennessee Lady Vols closed out the regular season with a commanding victory over Ole Miss, winning 81-56 on 51.8-percent shooting on Sunday at the Pavilion at Ole Miss. Tennessee (18-11, 7-9 SEC) was led in scoring by Meme Jackson,who hit five threes in route to 20 points while tying her season high of six assists. Rennia Davis and Cheridene Green also were in double figures for UT with 13 and 11, respectively. Evina Westbrook narrowly missed a double-double, tallying nine points and nine assists. The Rebels (9-21, 3-14 SEC) were led in scoring by redshirt senior Crystal Allen, who turned in 30 points. Freshman Gabby Crawford also was in double digits for UM with 16 points and nine rebounds. 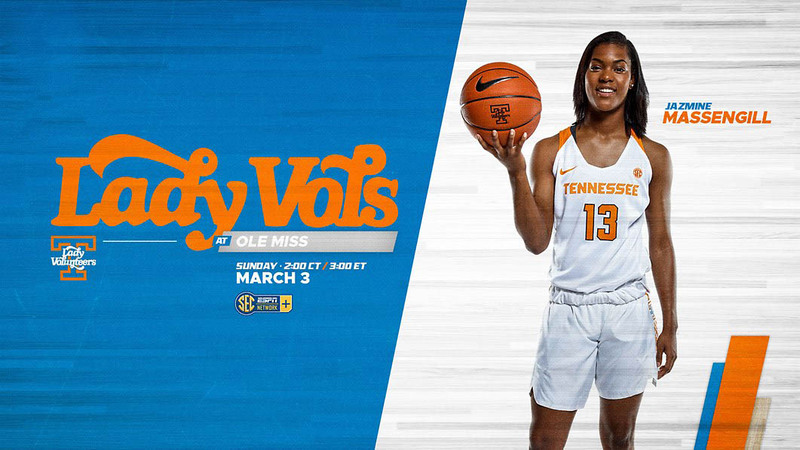 Knoxville, TN – The Tennessee Lady Vols (17-11, 6-9 SEC) travels to Oxford, MS, this weekend to close out the regular season vs. Ole Miss (9-20, 1-13 SEC) on Sunday afternoon. Tip-off is slated for 2:02pm CT (3:02pm ET) at The Pavilion at Ole Miss in a contest that is being streamed on SECN+. After winning five of six, UT has hit a bump in the road and has dropped three straight, including back-to-back home games vs. #13/13 South Carolina and Vanderbilt. 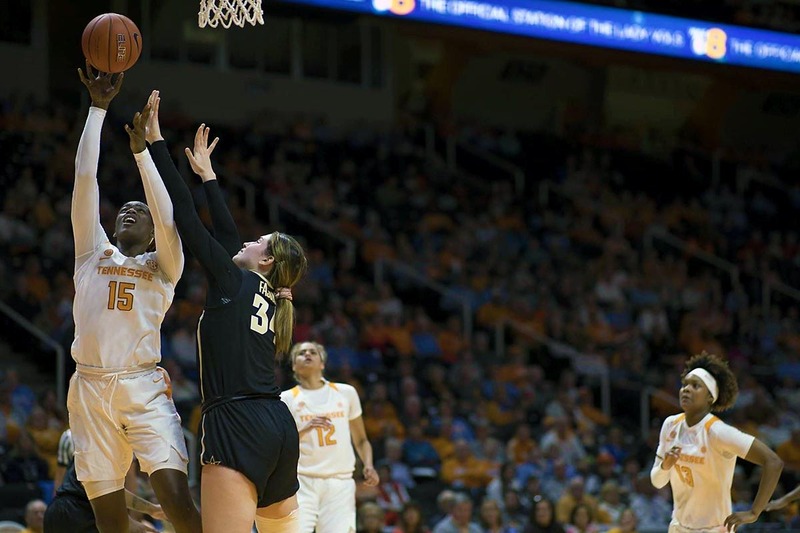 The Commodores spoiled the Lady Vols’ Senior Night on Thursday, overcoming a 10-point deficit to get their first-ever win in Knoxville, 76-69. 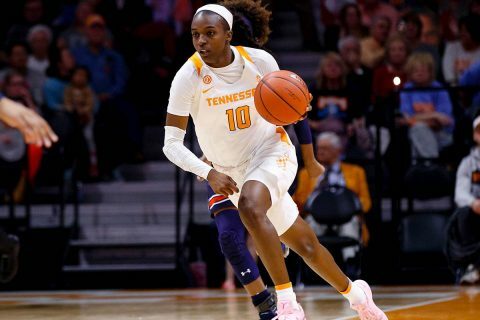 Knoxville, TN – Redshirt senior Cheridene Green posted a career-high 20 points, but it wasn’t enough to overcome a Vanderbilt team that shot 53.8 percent from the floor, handing the Tennessee Lady Vols a 76-69 loss at home on Thursday night. Green’s previous best scoring performance also came against Vanderbilt, on Jan. 17, 2018, when she tallied 17 points. 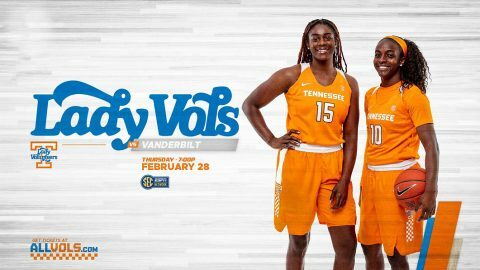 In addition to Green, sophomore Rennia Davis and freshman Mimi Collins were also in double figures for Tennessee (17-11, 6-9 SEC) with 14 each. Collins’ total was a career high, while Davis posted her 21st double-figure scoring effort of the season. Knoxville, TN – Tennessee (17-10, 6-8 SEC) closes out the home portion of its regular season schedule on Thursday by welcoming Vanderbilt (6-21, 1-13 SEC) to Thompson-Boling Arena. It’s Senior Night for two Lady Vols, as Cheridene Green and Meme Jackson will be recognized on-court prior to the game. Fans should plan to be in their seats by 5:40pm to catch the festivities. 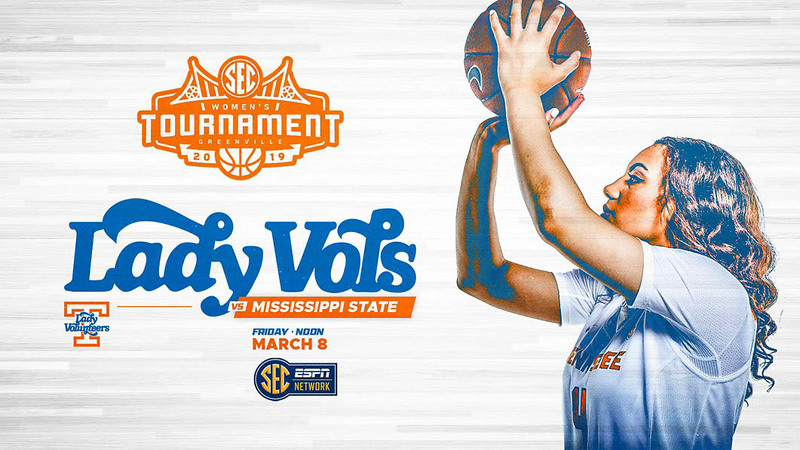 Tip-off is slated for 6:02pm CT on The Summitt in a contest that is being televised by the SEC Network. After winning five of six, Tennessee has dropped back-to-back games vs. ranked foes No. 21/22 Texas A&M (79-62) and No. 13/13 South Carolina (82-67). Knoxville, TN – A combined 18 second-half points from the sophomore duo of Rennia Davis and Evina Westbrook was not enough for the Lady Vols to complete a frantic comeback against No. 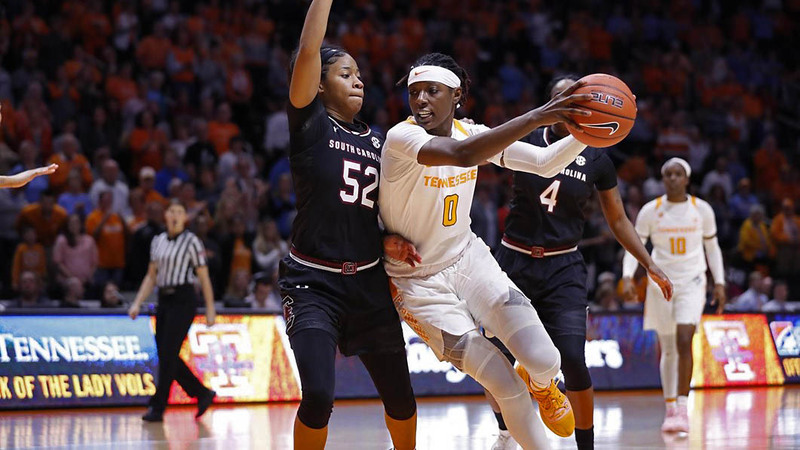 13-ranked South Carolina, which notched an 82-67 win at Thompson-Boling Arena on Sunday. Tennessee (17-10, 6-8 SEC) cut the Gamecocks’ lead down to seven points twice in the second half despite a 16-point deficit at the half. In the loss, four Lady Vols recorded double-digit points on the afternoon: Davis (15), Zaay Green (12), Cheridene Green (11) and Westbrook (10). Freshman Rae Burrell added seven points from the bench, as Davis and Cheridene Green led Tennessee on the glass with nine rebounds apiece. Knoxville, TN – After difficult back-to-back games on the road, things don’t get any easier. Tennessee (17-9, 6-7 SEC) returns home to host No. 13/13 South Carolina (19-7, 11-2 SEC) Sunday at Thompson-Boling Arena. Tip-off is slated for 3:02pm CT on The Summitt in a contest that is being televised by ESPN2. Including this match-up, the Lady Vols have three contests remaining during the regular season. The next two are at home (No. 13/13 South Carolina, Vanderbilt) and the last one is away (Ole Miss). The Lady Vols enter this contest having won two of their past three games and five of their last seven, including victories over LSU, Florida, Vanderbilt, Auburn and RV/RV Missouri.